Spring has sprung in the Northern Rockies. Warm sunny days interspersed with snow and rain mark Montana’s late spring. Time to exact revenge against all those relatives and friends who have been taunting you with tales of leaves on trees, shrubs in flower, and gardens abloom. After the drab palette of winter, the wildflowers of spring and early summer are a delight to the eye. One day it will switch to summer, but today it is spring. Here are six of our area’s most showy harbingers of spring. After a long winter, spring comes fitfully to the Rocky Mountains. 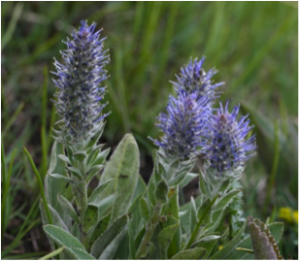 The bright purple appearance of Wyoming Kittentails (Besseya wyomingensis) is one of the first wildflowers to announce the warmer weather to come. The soft, fuzzy hairs of the rounded flowerheads earn the plant its “kitten tail” name while the stamens give the flowerhead its purple appearance. 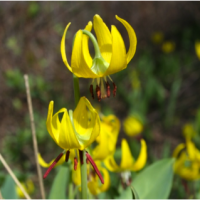 As the winter snows recede, Glacier Lily (Erythroniun grandiflorum) is one of the first flowers to bloom. They are often found in large colonies of bright yellow blossoms. This is one of several lilies commonly called “Dogtooth Lily” or “Dogtooth Violet”. Their underground stems are a favorite of bears and other wildlife. “Erythro” is Greek for “red” and may refer to the color of some species (not in our area) or to the red anthers. Meriwether Lewis collected the first specimen of this plant for science in present-day Idaho near the Clearwater River in 1806. 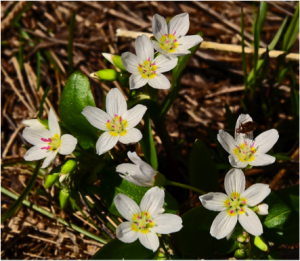 Look for Claytonia lanceolata, or Spring Beauty, in cool, shady areas where the snow has lingered. Dug after the plant has flowered, the corms (bulblets) are considered a special nutritious treat, raw or cooked. Meriwether Lewis collected the first specimens of this plant for science in 1806. 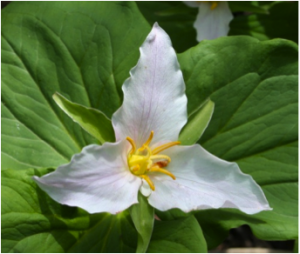 The common name of Trillium ovatum, “wakerobin”, alludes to the plant’s blooming about the time robins arrive on their spring migration – at least in warmer climes. In the northern Rockies, robins tend to arrive earlier than the Wakerobin blooms, forcing the birds to sit around in the snow awaiting the eventual coming of spring. Wakerobin flowers provide a vibrant splash of color to the early season woods and largely disappear from sight until the next spring. Several varieties of Fuzzy-tongued Penstemon (Penstemon eriantherus) are found in the region. The characteristic fuzzy-tongue or “beardtongue” is the single sterile stamen bearing a tuft of hair and protruding from the flower like a tongue. Penstemons are one of the largest genera of flowering plants endemic to North America. 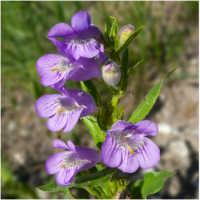 Penstemon is of Greek origin: penta meaning five, and stemon meaning stamen. 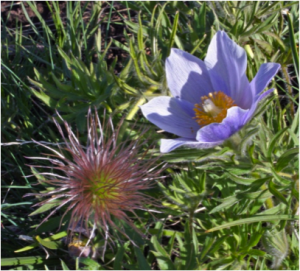 The crocus-like flowers of the Pasqueflower (Pulsatilla patens) emerge as the snow melts and the ground warms. Flowers emerge before the finely cut leaves and gives rise to one of its common names, “Prairie Crocus”. 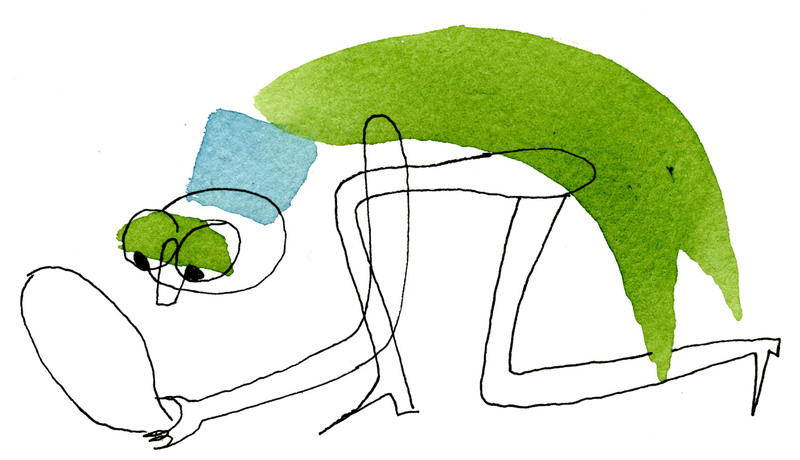 Late spring and summer visitors will find no flowers, just feathery plumes. All parts of the plant are poisonous and handling it can cause skin irritation. Its early blooming time, generally upright flowers, and deeply cut leaves help distinguish Pasqueflower from Sugarbowl. Pasque” is probably from the Hebrew “paschal”, “relating to Passover”. These flowers and many others await our coming. Let’s not disappoint.